This is the home page for a large collection of DIY camper van and RV self-build conversions. Included are big and small van conversions, tear drop and other compact trailers, and some unique conversions that will get you thinking. See the Page Index just below. 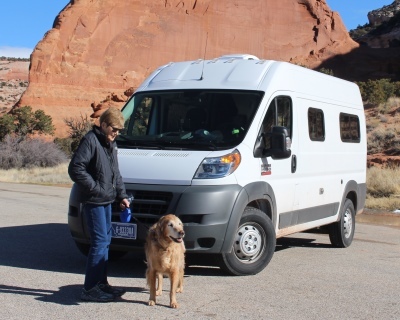 The first conversion listed is our own conversion of a RAM ProMaster, and is very detailed with many pages. Full descriptions are provided for insulating, electrical system, water system, galley, paneling, adding windows, ventilation, and floor. If you’ve done or know of a good conversion, please let me know so we can include material on it or provide a link to it. If you are doing a conversion and are looking for a place to tell the story — drop me an email — Contact Gary. A 60+ page detailed description of our own camper van conversion. Descriptions of DIY tear drop and other compact camping trailers. Some unique roof top and attached tent ideas for car or van. Hi Gary, our van will be arriving next week. I will pick up one CRL window by end of March as we will be gone all April sans van. Hoping to have one window install, 2 vents, floor and insulation per your recommendation in time for Fathers Day visit (in-law) in Northern California. Then take it from there. We are not fast workers but we do good work so no telling when major portion of build will be done. Regardless of state of completion, we will start travelling with it using it as a mobile steel tent. If you want to post our build I am hoping to use SmugMug in Journal mode showing pics and unfortunately one short write up above each group of photos. I prefer describing what photo is about below each one. Smugmug is not made for this sort of thing but I am already a subscriber. Would you recommend WordPress ? There is a freebie (with ads, ugh!) and not expensive version without ads as I recall. There is also PHP which I could handle but no time to delve back into the world of server side programming, maybe later as yet another hobby. I seem to have 1000 of them. I value your input as always. No hurry as this April trip will be another biggie and for sure get in the way of our van build. I do like WordPress. I think its a good compromise between capability and ease of use, and it has such a large following that its not going to go away (something like 20% of all websites are WordPress). There are two main flavors of WordPress: WordPress.org (nonprofit) and WordPress.com (commercial). I think that WordPress.org is probably the better long term choice and offers more flexibility. WordPress.com may be a little easier to get setup. WordPress.org does require that you find a hosting company, but there are tons of them out there for less than $5 per month. I would not go for the ones that offer free hosting in exchange for running ads on your site — you really want control of anything that appears on your site. You can add your own ads via (for example) Google Adsense — this is easy and fast. If you go ahead and develop the kind of site you plan to, the ad revenue will pay your hosting bills and then some each month. This way you have control over the placement and content of the ads. One of the strong features of WordPress.org is that there are so many add ons. Just about anything you want to do has been addressed by someone with a plugin, and WordPress does a good job of keeping some discipline in the plugin world with ratings and approvals. WordPress started life as a way of doing the Blog style website, and some people think that this is all you can do with WordPress, but it has become much more flexible over the years and it can be used to develop just about any type of website. Its also used for some very large commercial sites — eg The New York Times. Its a very capable package. I have another site (BuildItSolar.com) that is much larger and that I started around 2000. I started on Microsoft Frontpage (which I liked), then when Microsoft dropped Frontpage, I migrated to the product they replaced it with (also fine), then when Microsoft dropped that, I went to Adobe Dreamweaver because I was tired of migrating the site, and Dreamweaver as it was the most well established product out there. I don’t care much for Dreamweaver as it often requires knowing more about coding than I want to, and its expensive. I mention all this just to emphasize the importance of finding a good solid product that is going to be around for a good long time — migrations are a pain. I like WordPress from this point of view. Another main choice is the outfits like Weebly that offer a no coding way to set up a website. They are very easy to use, but somewhat less flexible than WordPress. Its also hard to say which of them will be around in a few years. Please do let me know when you get your site up and running and I’ll put a link into it. Gary, your responses never fail to impress me. First, let me ask if you know what Adobe INDESIGN CS5.5 is for ? Second, I have no interest in selling ads with whatever I cobble together but good that you mentioned that as “never say never”. I have time to create a web site of some sort as Kim and I are still rebuilding our retirement home. We gutted all, HVAC, insulation, electrical, plumbing, flooring, etc and that keeps us busy in between overseas trips, soon to be van travel. We are versatile workers that enjoy doing this ourselves. I manually did all Manual J calcs on Excel using the $100+ official ACCA book as a guide. Next comes Manual D for HVAC air delivery. Been doing this since age 9, built working steam engine for science fair back then. Designed and managed very big industrial equipment system through the country, followed later on by software design. All told, I have enjoyed being creative for 55 years until recent retirement. But I digress ….. Your problems with platform disappearing is par for the course in most industries but especially the software industry. I agree with you in looking for companies that will be around and have popular platforms. I would also add that when you use someone’s platform, structure your content in your PC in a way that will easily permit you to move elsewhere when the time comes. I am very independent and believe in being self sufficient. Not surprisingly, in the digital content world, ASCII text is king, those 128 characters have been around forever, try reading Wordperfect files today without jumping through hoops. With photos, I shoot RAW, with my books I buy real books. Have lots of very old books I will enjoy forever. Digital books need a proprietary reader that you know will not be around. Can you say 8 track, cassettes, VHS, BetaMax ? Converting media is possible but it will have to be something very special or valuable. I use Smugmug for my photos now. My strategy is to use standard PC file system to organize all categories in same fashion as displayed in Smugmug, a straight lateral organization transfer. Photo captions when I use them, are built into each photo when I process them in Lightroom. Smugmug category header description I create and store in a text file on my PC and copy & paste them on Smugmug. The reasoning is that should I leave Smugmug or they close shop or I have time to create my own photo site later, ALL content is on my PC, organized and ready to move. I back up to two other external drives, one off site. Soooo Gary, as you might have guessed by now, WordPress ORG sounds really good to someone like me as it eliminates a few layers between me and what the user will see. Will be a while before I start formal build documentation but will start taking photos from day one, likely at the dealership when we pick it up next week. Maybe I will start posting them in Smugmug as stand alone photos until I have enough useful content to warrant spending time creating a WordPress site. By the way we already have our California license plate waiting for pick up at local Auto Club, I saw them but without the van in their parking lot they wouldn’t hand over. The plate reads “A DUCATO”. Remembering to take LOTS of pictures as you go was definitely the hardest thing to learn for me. You get wrapped up in building something, and the last thing you want to do is stop and take pictures. But, pictures are the key to the kind of website you want to build. Indesign is part of the Adobe Creative Cloud package of tools (like the Lightroom you use) — I think its aimed at doing posters and fancy page layouts. I’ve never actually used it myself. For building your site, you might also want to look at something like the CoffeeCup tools. These are much closer to the “bare metal”, and that would make it easier to stay away from proprietary approaches. There is just a bit more learning curve to get started, but sounds like you are part way up that already. On both sites, I’ve tried pretty hard to keep the ads out of the way and not to do any of the obnoxious stuff that is becoming so common. Like the license plate 🙂 It could be the logo for your website. Its a simplified form of Manual J, but it does do some things that Manual J does not cover. Thanks Gary, all solid advice. Ads are ok and I certainly would not count on them but nice to know it could offset any web costs. Agree on the photos while working. Did that when I overhauled a trailer’s electrical, battery systems and 12v refrigerator system. I think I took enough to TELL A STORY !!!! Did that for my own records. Very nice writeup — thanks. Would like to hear more about your new interior as you get going on it. The she-boss picks up our Promaster tomorrow. Your website/presence will be invaluable as we start the long road toward cowboy camping! So far the most important discovery here is the method you used to work in the warm on your PM during the cold snowy time. Thanks again for what you’ve provided us! Right — having a warm place to work in makes all the difference. Keep us posted on how the conversion goes. Thanks so much. Our step-by-step will be incredibly slow. As an example we know we want to do a platform bed but haven’t the first clue on even how one would attach anything to the walls side to side. But all of this will be a process of discovery-doing-messing-up-redoing-learning. I do have one question please as we get our plan of attach up and running. The question is about your furnace/heating. Did you not put the propane inside the vehicle, inside a cabinet? I do realize it vents outside. For some reason I thought the propane tank itself is supposed to be outside by law ????? Being able to stay warm is critical for me, just the opposite for the better-half. I’m not sure about law on tanks in the US. I know its quite common in Europe to have propane tanks in a sealed compartment that is vented to the outside (which is what I did). This is also common in boats. Our last RV (commercially made) had a propane tank mounted underneath, and we found it to be a pain in that the exposure to the weather, road dirt and mud, made for a lot of failures and repairs. I much prefer the inside tank. Gary; thank you for prompt response. We planned our preferred layout first hoping the systems would fall into place. In hindsight maybe not the best sequence, but we will make it work. Thank’s again. Cheers Roger Nash. Hi! Great van conversion! Where did you get those small windows? We need a couple for our sprinter van for our loft area. But, the curvature of the Sprinter sidewall might be greater, and the flat windows may not work? I have a 1999 ford e-150 van, body edges rusty, need support arms, right side.